This tent could one day be your home. It will provide you with shelter from the elements, food, energy, and purified water. Meet the Urban Algae Canopy — perfect for all your environmental apocalypse needs. This prototype is the brainchild of Italian design firm Carlo Ratti Associati, and were previewed during last month's Milan Design Week. The idea is to create a living structure whose very walls are thriving algae colonies. Algae is an incredibly useful life form, and it can be modified to perform a lot of functions, from generating energy through its natural photosynthetic processes to serving as a basic food item. One day, algae could even be genetically modified to serve as a light source, a chemical sensor, or a water purification device. For now, Carlo Ratti Associati are just focusing on its potential to serve as a form of living building material, regulating temperatures and providing energy. The functioning principle of the prototypes is based on the exceptional properties of micro-algae organisms, which are ten times more efficient photosynthetic machines compared to large trees and grasses. The façade and canopy currently being developed for EXPO Milano 2015 develop a natural man-made ecology and explore the use of algae as an integrated architectural cladding and urban agriculture system." Algae can represent an important part of creating a healthy and liveable planet. Giving life to mysterious urban gardens, algae can be used as an innovative energy and food production system within our cities. Micro-algae perform an important photosynthetic activity, absorbing considerable amounts of carbon dioxide and producing oxygen, and growing into a biomass, which can be processed for energy, cosmetic, pharmaceutical and nutraceutical markets. "Micro-algae open up an incredible potential for new renewable energy resources, and hope for a greener future. Building and architectural surfaces are an incredible resource of space. Urban façades and roofs represent billions of square metres that instead of being made of an inanimate material such as concrete, could become clever photosynthetic surfaces that respond to the current state of climate warming. Micro-algae could add to the green urban system that exists already, intensifying carbon dioxide fixation activity and acting as cladding for buildings, increasing their passive performance. 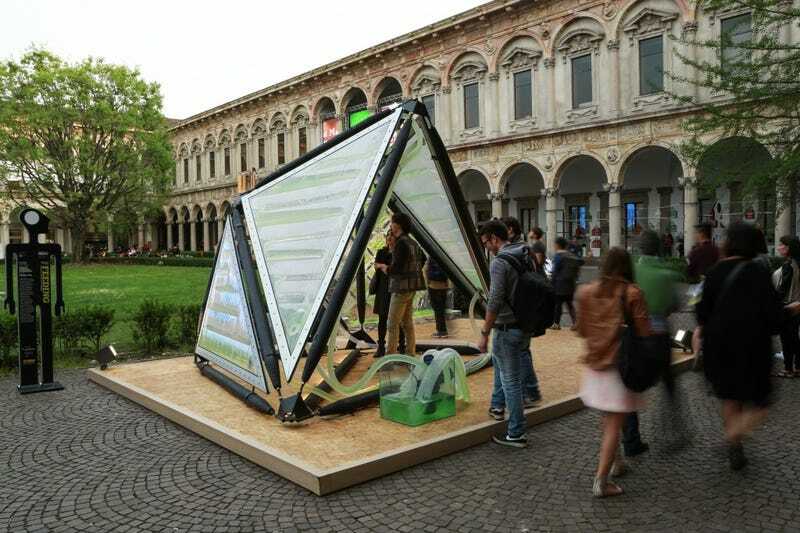 The Urban Algae Canopy – based on ecoLogicStudio's 'HORTUS' system, is presented here with a 1:1 scale prototype of the world's first bio-digital canopy integrating micro-algal cultures and real time digital cultivation protocols on a unique architectural system. The potential of micro-algae have been integrated within a custom designed four-layered ETFE cladding system, whilst the flows of energy, water and CO2 are controlled and regulated in real-time and made to respond and adjust to weather patterns and visitors' movements. Once completed, as part of the EXPO Milano 2015 Future Food District, this special edition of the Urban Algae Canopy will produce the equivalent amount of oxygen as four hectares of woodland, and up to 150kg of biomass per day – 60% of which are natural vegetal proteins.